Visitors from China and around the world pass through the ancient city of Xi’an on their way to the Terracotta Army in the nearby Lintong District. While the Terracotta Army is indeed a marvel, many visitors don’t realize the bustling, modern city of 13 million has a lot to offer. With thousands of years of fascinating history and an energetic, contemporary vibe, Xi’an is worth spending a few days exploring before you check out the famous clay warriors. Xi’an was once the most important city in China, making a visit there pretty much essential. Xi’an has been the capital to at least 13 different Chinese empires and kingdoms. Its history dates back to prehistoric times, much further back than the current capital Beijing. 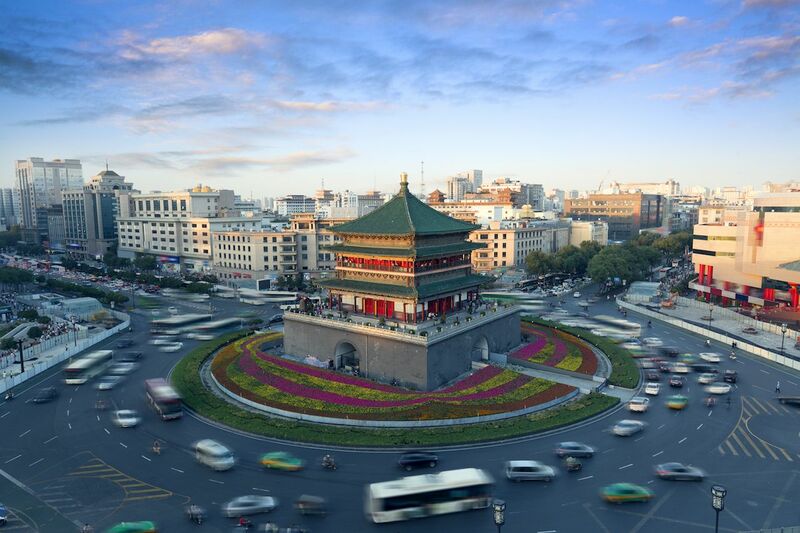 From being the capital of ancient feudal cities to the first capital of a united China in 221 BC, then to numerous dynasties and kingdoms, and now a thriving modern city, Xi’an’s history runs deep. Notably, Chang’an (Xi’an) was the capital during the powerful Tang dynasty from 618 to 904 AD, and served as the eastern end of the Silk Road — the important trade route connecting China to the Middle East and Europe. At that time, Chang’an was the largest city in the world and home to one of the most progressive empires. With the Chinese high-speed rail system, it’s comfortable and cheap to travel to Xi’an from any other major Chinese city. Once in Xi’an, its efficient and rapidly expanding public transit can get you to all the major sites, and you will be pleasantly surprised by how the subway and roads are better kept than in many cities in the US. From magnificent drum towers to tranquil pockets of nature, here’s everything you need to see on a trip to Xi’an. 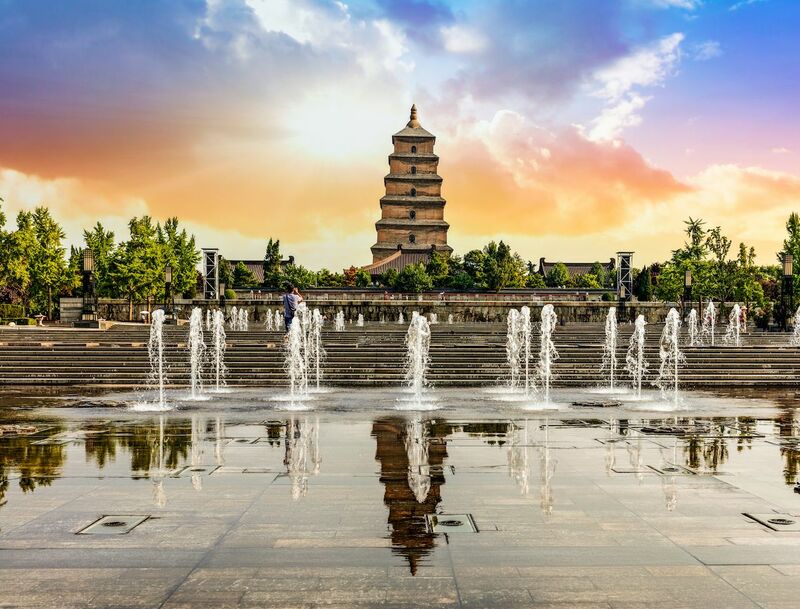 The Giant Wild Goose Pagoda was built in the Tang Dynasty of China and is one of the last few remaining pagodas that covered the ancient city of Chang’an. Monk Xuanzang, the first abbot of the surrounding Da Ci’En temple made a 17-year pilgrimage to India to bring back ancient Buddhist relics and Sanskrit texts. Sitting tall atop a hill surrounded by trees and ancient buildings, the well-kept ancient structure is an imposing site. The surrounding area is equally appealing. Every night, the whole area is lit up with bright colors coming from all sides. The North Square has one of the largest fountains in Asia and an evening water show. On the South Side, across from a square with a statue of Monk Xuanzang is the Great Tang All Day Mall. This walking strip is the perfect place to spend an evening with an abundance of public art celebrating one of the most important and progressive Chinese dynasties, bright lights, and shopping. While there, grab a bite to eat, stop to dance with a live DJ, and maybe spontaneously decide to take in a Chinese opera at the Opera House located on the walk. One of the most well-preserved pagodas from the Tang dynasty times, this temple was built in 701 to hold Buddhist texts brought by Monk Yi Jing in a pilgrimage from India. Continual renovations have maintained the original structure, and its unique architecture and details are just as interesting as those of its bigger sister, the Big Wild Goose Pagoda. While damaged with a crack from the earthquake in 1556, the majority of the structure is still in good shape. Within walking distance is the Xi’an Museum. The Xi’an Museum has an astounding 130,000 relics starting in the 11th century BC all the way through modern history. You can compare relics side-by-side from one dynasty to the next and revel at the richness of Chinese history. As you observe incredibly well-kept items and imagine their original uses, it’s easy to forget that many of the items are literally thousands of years old. While not as famous as the Shaanxi History Museum, Xi’an Museum is slightly less crowded and nearly as impressive. Daming Palace is three times the size of Versailles, four-and-a-half times the size of the Forbidden City, and 15 times the size of Buckingham Palace. Daming Palace is huge. Excavated in the 1950s, it is the ruins of what used to be the magnificent Imperial Palace of the Tang Dynasty, from the years 618 to 907. While nowadays none of the original buildings made of wood remain, visiting the site can still give you a feel for the magnificent size and history of the palace. Daming has numerous exhibits that help visitors understand the palace better, including an underground museum built beneath the ruins, which celebrates the history of the palace with artifacts and maps. During the Tang Dynasty, Xi’an was the end of the Silk Road, which led the city to be heavily influenced by Arabic culture. 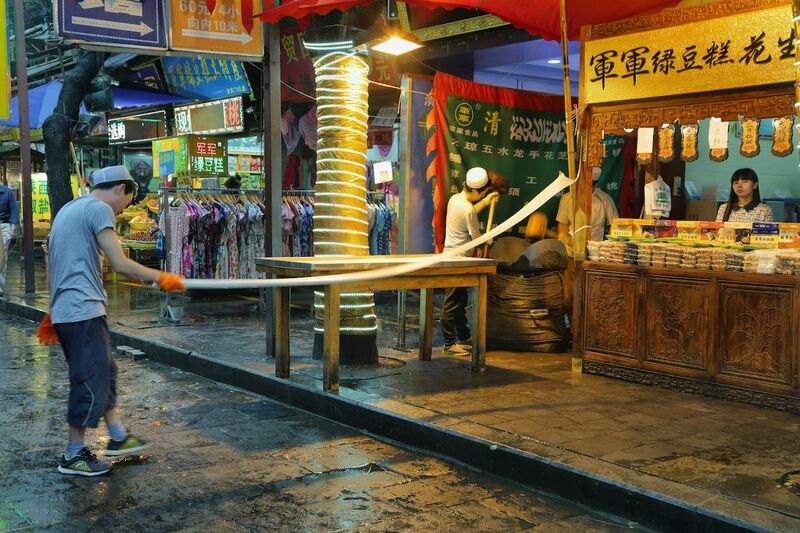 In the historic Muslim Quarter of Xi’an, stop by the Great Mosque in the Muslim Quarter. The mixture of Chinese and Arabic influences is particularly pronounced in the unique architecture and the Grand Mosque’s long history. 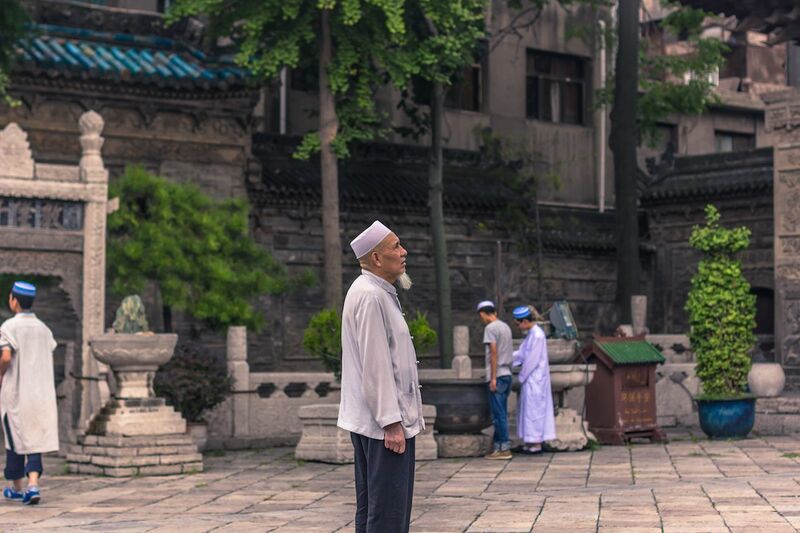 A tour will teach you more about the similarities and differences between the ancient Chinese Islam of Xi’an and that of the rest of the Islamic world. Xi’an’s food is famous for its Arabic influence, and there’s no better place to enjoy this unique cuisine than the Muslim Quarter. Lining the busy walking streets, you’ll find food vendors selling delicious Xi’an foods like lamb PaoMo, a bread crumb soup dating back to the Tang dynasty; Chinese hamburgers; kebabs; and biang biang noodles, a tangy and peppery dish that’s specific to Xi’an. The best restaurants are typically found off the main streets. The Bell Tower, built during the Ming Dynasty in 1384, is one of the most impressive preserved bell towers of its time. In the geographical center of the city at an intersection, the tower dazzles with its bright colors and ancient architecture. While walking around the outside, take in the sweeping view of the modern city. Inside, you can find several large bronze bells from the Tang dynasty, as well as ornately decorated rooms filled with Chinese designs. The Drum Tower is similarly striking. Its visible from the Bell Tower, and you can travel there within a five-minute, mostly underground walk to avoid the extreme Xi’an weather. 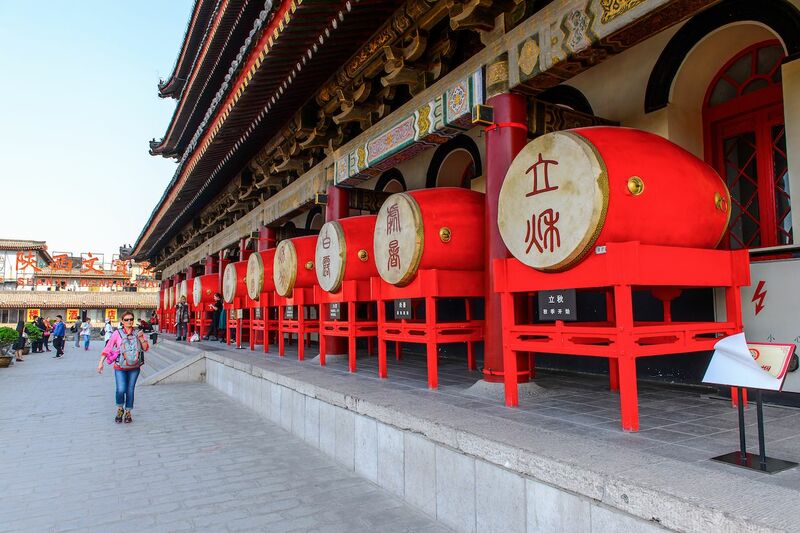 Also built in the Ming Dynasty, it got its name from the huge drum located inside that used to be drummed when the sun set. While visiting the Drum Tower, you can easily lose track of time getting entranced by the regular musical performances. Xi’an is one of the few Chinese cities to have preserved its historical city walls. 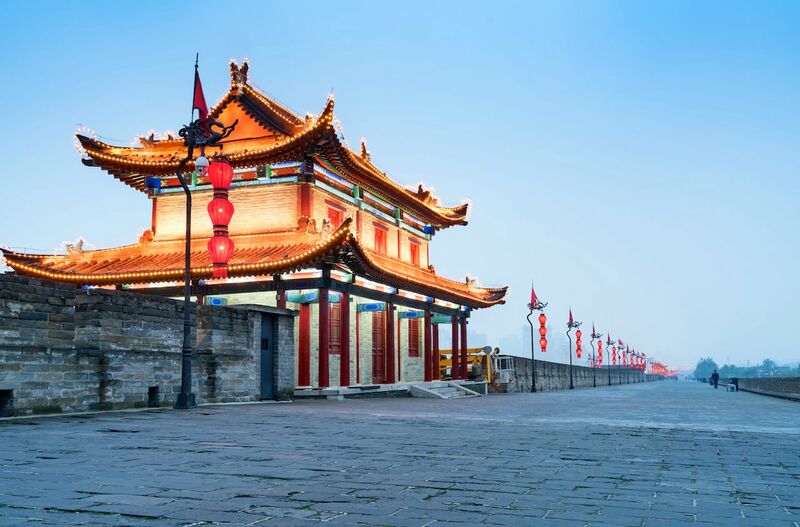 Originally built during the Tang Dynasty — and rebuilt and restored numerous times since — the Xi’an city walls are a great place to get a feel for the city. If you can, rent a bicycle and do the entire hour-and-a-half-long bike ride to get the full experience. Along the way you can see guard towers and different imposing main entrance gates while also observing details — such as a slanted ground to prevent flooding. As you bike, you will notice that the more historical, preserved buildings lie inside the city walls, while the area outside the walls reflects a more modern city of endless high rises. 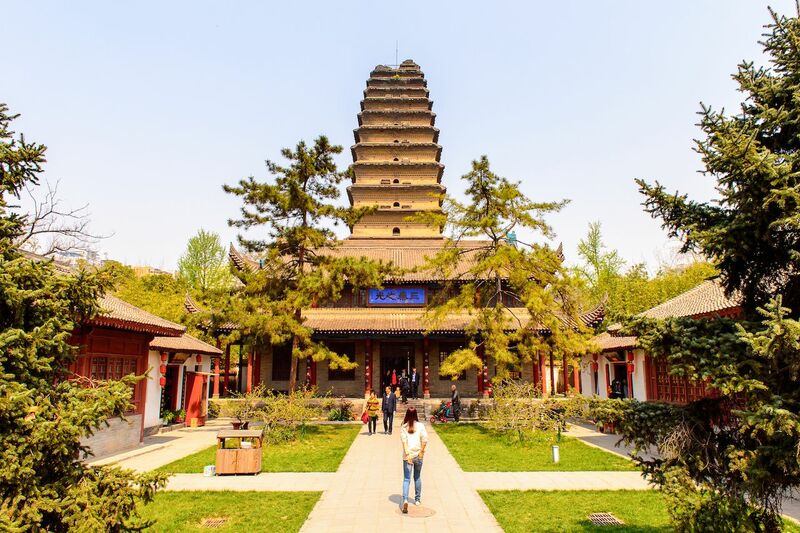 Located in the wealthier neighborhood of QuJiang, Tang Cultural Paradise Park is a fun place to enjoy a day at the park while also learning more about the history of the Tang Dynasty. Tang Cultural Paradise Park is modeled after the Emperor’s gardens during the Tang Dynasty, one of the peaks of Chinese civilization, and is one of the most beautiful places in all of Xi’an. 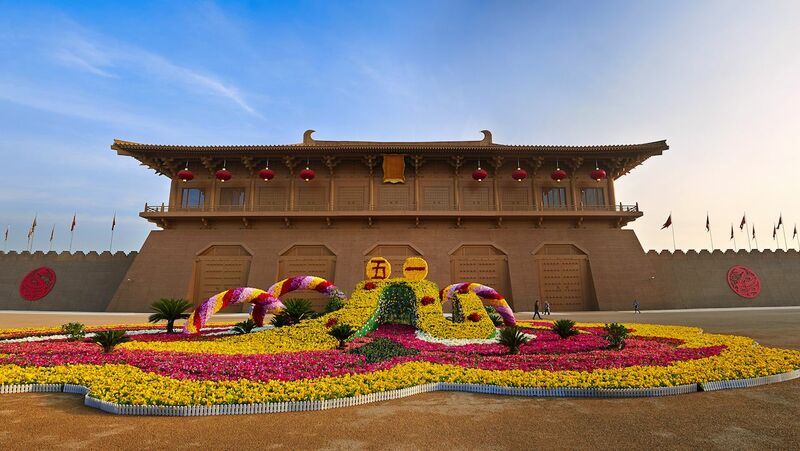 Throughout the park are recreations of Tang Dynasty buildings, with architecture from that time and actors in costume. 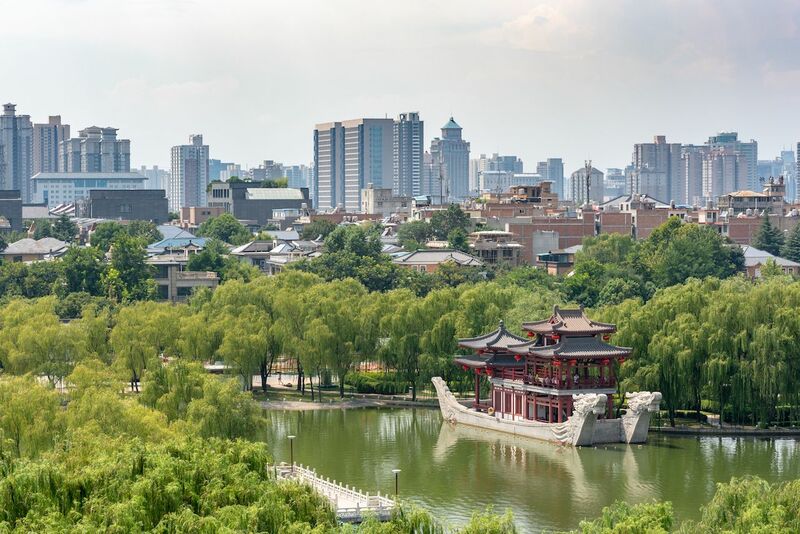 If you climb to the upper levels of the taller buildings, you can catch views of the urban Xi’an that surround the park and of the Giant Wild Goose Pagoda. As a park, Tang Paradise Park is clean and peaceful, and offers a lot to do. About half the park is a lake, and you can walk amongst the willows as you go from exploring one Tang dynasty building to the next. If it’s summertime, you can stop for ice cream to cool down in the shade by the lake or take a paddleboat out onto the water. In the evening, regularly scheduled performances recount the history of the Tang dynasty; these are followed by spectacular light shows. While travelling in China, you may find yourself needing a new book to pass the time during the hours spent on bullet trains travelling from city to city. Across the street from the Tang Dynasty Paradise Park, Qu Jiang book store is the perfect place to pick one up. It’s modern and, if you’re fed up with Xi’an’s sweltering summer heat, an air-conditioned oasis. Qu Jiang Book Store is three floors and each is filled with books in all languages. In addition to countless books, it also has a kids arts and crafts area on the third floor, a garden store, and even a hair salon. 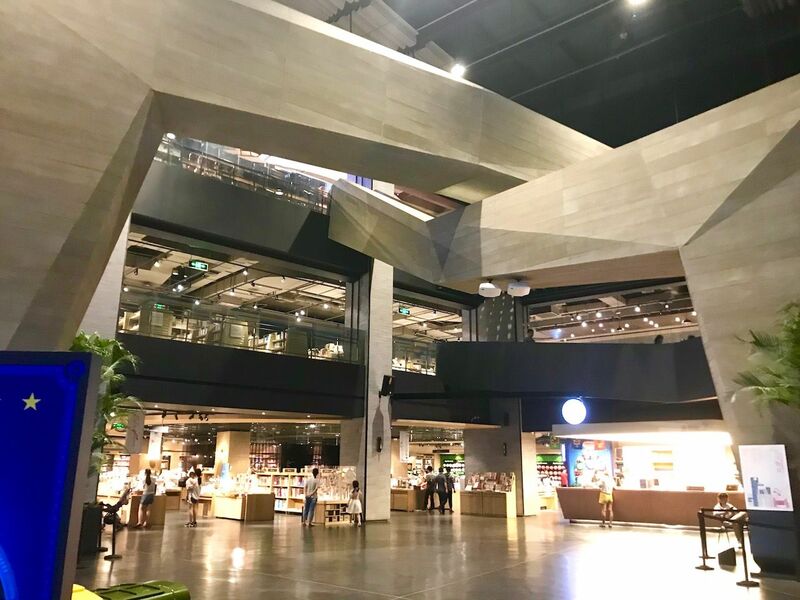 Once you’ve bought your books, across the street and right next to the Tang Dynasty Paradise Park are tons of delicious, local-favorite restaurants. A few I’ve eaten at and enjoyed were 荷唐壹号, hot pot; 佰人王串串香火锅(大唐芙蓉园店), hot pot but with your food on sticks; and 大唐回珍楼(芙蓉南路), traditional Xi’an and Chinese food. If you haven’t overdosed on Xi’an’s rich history by now, Shaanxi History Museum will put you over the edge — in a good way. 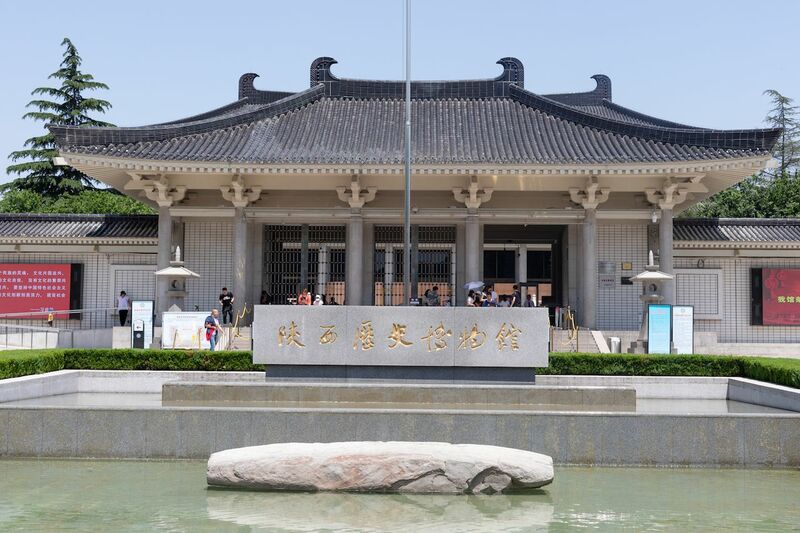 While it can be pretty busy during peak times, Shaanxi History Museum still hosts a jaw-dropping collection of artifacts chronicling the history of Shaanxi province in Northwestern China. The map of history it paints is incredible, with over 370,000 items from prehistoric times to about 1840 BCE. The murals, intricately decorated preserved pottery, and gold and silver items will blow you away, especially since so many of the objects you’ll see are well over a thousand years old. The Museum is modeled after Tang architecture, with numerous wings focusing on different eras of history, and English tours are available. If you’d rather go it alone, you can still spend all day reading the signs and enjoying the splendor of ancient China. An hour outside of Xi’an is breathtaking Hua Shan and the surrounding range. Steep and rocky, with jagged peaks and lush greenery in the wetter months, they really are dramatic. In addition to the stunning mountain views, Hua Shan is one of the five sacred Taoist mountains in China, with different temples and shrines at its peak. It’s also the site of one of the most dangerous hikes in the world. 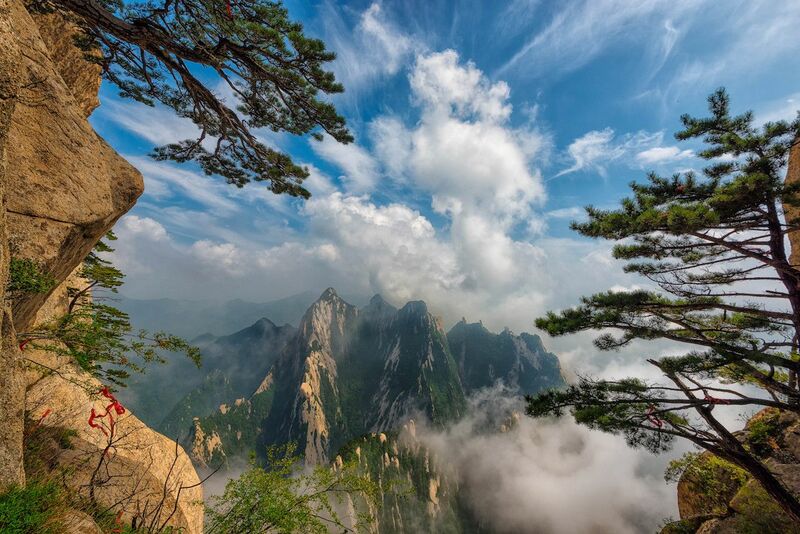 Hua Shan has a cliff-side mountain hiking trail that involves a six-hour trek; clipping into cables; and walking across sketchy, nailed-together planks alongside a sheer cliff face. It is said that hundreds of people fall fatally each year. Needless to say, you shouldn’t hike Mt. Huashan without a guide and prior climbing experience. Thankfully, if you aren’t willing to risk your life, you can still experience the mountain scenery — and the tea house on top at over 7,000 feet — by heading up on the safer, albeit still rickety, gondola.